Pipelines safely connect Americans to the energy we use every day. How safe? More than 99.99 percent of the natural gas, oil and petroleum products shipped via pipelines reach their destinations safely. And while that safety record is virtually flawless, America’s pipeline operators are focused every day on getting closer to perfection – helped by ever-improving technologies, industry standards, data and proactive, 24/7 monitoring. It’s a big job, considering the U.S. leads the world in energy production and delivery with the most expansive pipeline system in the world. This includes more than 200,000 miles of liquid pipeline running from production areas to refineries and then to consumers, enough to circle the Earth eight times. Safe operations and protecting communities and the environment are core industry values – supported by smart technologies, state-of-the-art processes and designs and advanced materials. Nearly every pipe in the country is made of the highest grade steel, with strengths typically ranging from 70,000 to 80,000 pounds per square inch (psi). That compares with a range of 36,000 to 50,000 psi in the steel used for tanks and armored personnel carriers. This level of steel strength ensures our pipeline systems can endure the toughest conditions. Meanwhile, industry professionals are focused on all aspects of pipeline safety, from technology and equipment to human behavior. Since 2014, the American Petroleum Institute and the Association of Oil Pipe Lines (AOPL) have collaboratively worked with liquid pipeline leadership through the Pipeline Safety Excellence Initiative, to establish shared safety principles and commit to a long term strategy that promotes continuous improvement and excellent safety performance. Recognizing the need for longer term strategic planning in 2017, the pipeline industry lengthened its planning horizon to three years and broadened its strategic safety focus to align with industry-wide safety efforts. We’re advancing pipeline safety technology, improving engagement with key stakeholders and the public, strengthening emergency preparedness and response planning, and adopting holistic pipeline safety management systems. Through highly trained pipeline control personnel and advanced technology, the industry actively monitors its infrastructure around the clock to ensure each pipeline performs and operates as it should. We’re able to identify potential problems and respond quickly to resolve issues and minimize effects on the public and the environment. Data acquisition is essential to monitoring this critical infrastructure. Supervisory Control and Data Acquisition (SCADA) systems are used to control, observe and analyze data from sensors placed in pipelines, which communicate real-time data to a central location. This allows experts to keep an eye on thousands of miles of pipeline – most located in very remote areas – addressing potential issues for fast action and evaluating historical data to forecast future needs. Like many midstream companies, Plains All American remotely controls its pipeline systems through an Operational Control Center, which runs 24 hours a day, seven days a week. While monitoring over 850 remote sites, the control center oversees the liquid product movement of more than a billion barrels of liquid product every year, maintaining system integrity and detecting leaks. If operators find leaks or inconsistencies, they have the ability to rapidly shut down a pipeline, remotely cutting off pumps and closing isolation valves. Companies also deploy a variety of innovative technologies to keep operators abreast of the system’s integrity. Smart Pigs, an in-line inspection tool, detect conditions that could affect operations. This diagnostic tool – which gets its name from the sound it makes as it travels inside pipelines, scanning the walls – uses technologies similar to an ultrasound or MRI to locate microscopic cracks and significant residue buildup. 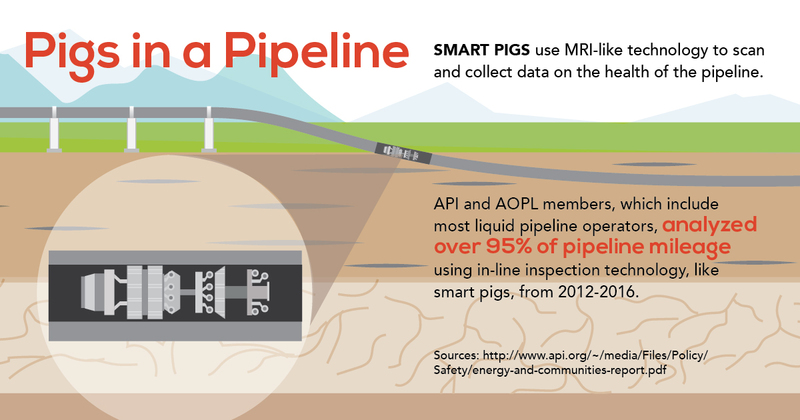 Information from smart pig missions allow operators to develop maintenance plans when needed and repair sections of pipe before putting it back online. By implementing best practices in the workplace, including pipeline safety management systems, employees can learn field-tested ways to perform preventive maintenance, identify issues and ensure pipeline quality. Both liquid and gas pipeline operators are implementing API RP 1173, Pipeline Safety Management Systems, to gain better information on the safety of their systems, learn where they can improve and measure progress towards improved safety performance. Additional programs like the Pipeline Integrity Workshop offer forums to discuss ongoing efforts to enhance pipeline integrity guidance. Educating community members adds another set of eyes on the ground. The 8-1-1 Call Before You Dig program has a call center that the public can call before excavating to avoid damaging pipelines and other utilities. The service informs companies whose infrastructure could be affected. Chevron promotes this one-call process and teaches the public how to recognize and respond to pipeline issues through its Community Awareness and Outreach Program. As part of these activities, Chevron distributes informational brochures to communities and businesses along existing pipeline right-of-ways, as well as local government officials, emergency response personnel and members of the construction and excavation industry. Keeping everyone and everything that may have contact with our products and pipelines safe is critically important to us, and we strive for continual improvement to show that commitment.